May 13th saw the signing of an agreement in Beijing between Hanban and the University of Basel to launch a Confucius Institute in Basel. Hanban, which oversees all Confucius Institutes around the world and whose headquarters is located in Beijing, is a non-profit organization affiliated with the Ministry of Education of the People's Republic of China. The delegation subsequently went to Shanghai to sign a contract with the East China Normal University. Prof. Dr. Antonio Loprieno, the principal of the Universität Basel and Xu Lin, the director of Hanban, sign the contracts. Confucius Institutes have been established in more than one hundred countries. They aim to promote the Chinese language and culture, support local Chinese teaching internationally, and facilitate cultural exchanges. As such they are important bridges between the China and the West. For Basel this will be a unique opportunity to offer students at the Confucius Institute the possibility to fathom China through the eyes of the Chinese and to further strengthen the city partnership between Basel and Shanghai. The institute in Basel is the second one to open in Switzerland after the one in Geneva opened in 2011. 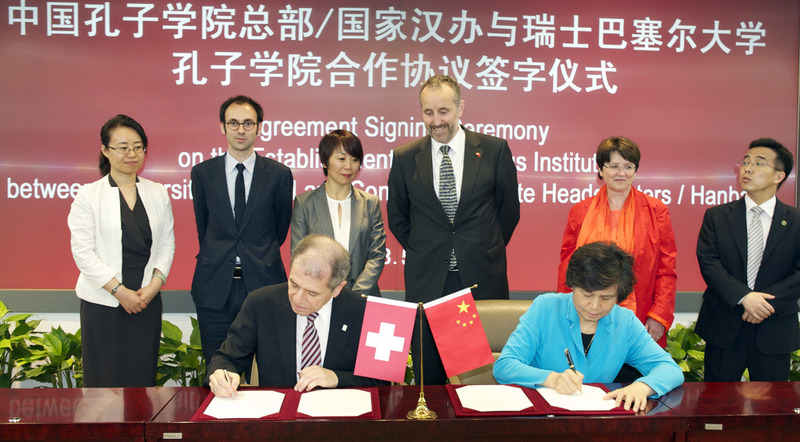 The city of Zurich is still in discussion with Hanban to open one. The opening ceremony of the Confucius Institute in Basel is scheduled to take place on September 21st, 2013.